Bipolar disorder (BD) affects 1 to 1.5% of the world population and consists of at least one manic episode (or hypomanic) associated with depressive episodes, interspersed with periods of euthymic mood. Recurrent crises lead to significant disability in BD patients, and correlates negatively to social and occupational adjustment. Such disability can be explained by a series of events, such as cortical and altered metabolic activity, impairments in cognitive functions, and in core anatomical structures involved in mood modulation. Therefore, our review aims to provide information on the current research related to the pathophysiology of BD. We will review the cognitive and brain functioning, and biomarkers of BD. The current literature shows that cognitive deficits are commonly observed in all phases in BD patients, independent of a remissive state. These deficits are assigned to functional, structural and metabolic changes, particularly in the pre-frontal cortex region, hippocampus and amygdala, along with the connections between them, as well as decreased baseline brain-derived neurotrophic factor levels or imbalance between pro- and anti-inflammatory cytokines, implying a lower physical ability to reestablish from a stressful stimulus. 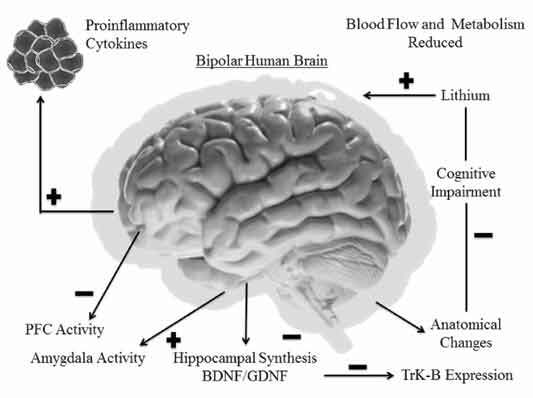 BD patients effectively present a differentiated pattern of cortical, neuroanatomical and functional responses. It is suggested that physiological processes occur differently in bipolar subjects compared to healthy individuals, affecting behavior and brain function in such patients. Future directions are yet necessary to establish the best way to neutralize or reverse these events. Bipolar disorder, brain-derived neurotrophic factor, depression, mania, neuroplasticity. Filho, Panic and Respiration Laboratory, Institute of Psychiatry (IPUB) – Federal University of Rio de Janeiro (UFRJ). Rio de Janeiro, Brazil.